This is full of spoilers, so be alert (but not alarmed). 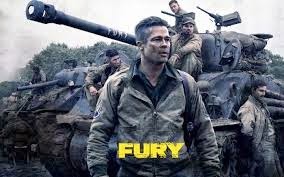 Unlike Brad Pitt, I miraculously survived Fury, but I was left with many unanswered questions. Questions like why did Hollywood, 69 years after the end of the war feel the need to produce a propaganda film? Are there still ally soldiers scurrying across Europe looking for “Krauts” that need a bit of pepping up? What the hell was the eggs for lunch scene all about, and why was it so damn long? Norman sits down to play the piano whilst his comrades are raiding properties to rid the earth of the scourge that is Nazi military, yet the sound of the music does not result in a quick and brutal response from the troops outside. Neither did the movement of Irma at the window as she cooked the eggs. On the cooking of the eggs, did Irma cook the eggs really slowly or was Norman REALLY quick in the bedroom with Emma? The loved up couple were ready before lunch was served. How fortunate was it that when the house in which Irma and Emma resided was bombed in an airstrike and the building collapsed on top of them that Emma’s body ended up neatly on top of the rubble? Her position made it easy for Norman, who falls in love as fast as he orgasms, to bid her an emotional farewell. Was the tank “fury” made by the A-Team? Just like the cast and their 1983 GMC Vandura G-class cargo van and their endless cavalcade or homemade armoured vehicles constructed by welding rubbish bins to golf carts, the tank was indestructible. No amount of bullets, missiles or anti-tank artillery can stop this vehicle or its inhabitants. Finally a land mine does break its tread, the equivalent of a flat tyre. Something not even B.A. Baracus had to contend with. Now stranded in the middle of a crossroad, the very crossroad they were there to defend, they have to defend themselves against a platoon of SS soldiers. How did they know they were SS troops? Brad Pitt told them so, apparently he could tell by the sound of their singing. The fight commenced in broad daylight, yet suddenly changed to middle of the night. I know in the Arctic Circle that sunset can last days if not weeks, but can it change in a blink of an eye from day to night in Germany? I don’t know I have never been there. The inhabitants of the tank fight courageously killing off hundreds of German soldiers. Singing SS soldiers no less. They kill them in a way only an American tank lead by an all-American hero in an American made movie can. Many of the German’s were on or at the base of the tank at the time they were killed. They fell into the mud around the tank. Where did the mud come from as there was no rain? That aside, who moved all of the bodies off the road onto one of the four verges surrounding the intersection? As the camera pans up, all of the German casualties are clear of the tank leaving the vehicle sitting like a round-a-bout in the centre of the cross road. How did Norman know the footsteps on the tank the day after the battle were those of American troops rescuing him and not German troops ensuring everyone was dead? Maybe Brad Pitt taught him how to discern military allegiances by sound – the same way he good discern the oncoming Germans were SS troops. Thankfully he knew he were American and did not shoot them when they opened the hatch. Who cleaned the window on the rear door of the ambulance? When filmed from inside the ambulance the window was covered in dirt and grime from the road making for an eerie and gritty shot as Norman looks out of the ambulance at the death around him. Then the angle changes to outside the ambulance looking back at the distressed Norman as he drives away. Now the grime is all but gone so that the window perfectly frames Norman’s face. Despite all of these and many more questions arising from this Sony Pictures production but the biggest is Brad Pitt’s hair. Ignoring the very non military style, it is always perfect. No amount of time inside or riding a top of a tank or hours wearing a helmet, not even endless battles will mess this do. At worst it looks as though a mate has given his hair a quick tussle, but the quiff only moves from salon perfect to carefree. Either way his hair was always at the ready for a fashion photography shoot or a red carpet.